The day her long-awaited ethics trial was supposed to begin, Rep. Maxine Waters (D- Los Angeles) stepped up her attack on the case against her. 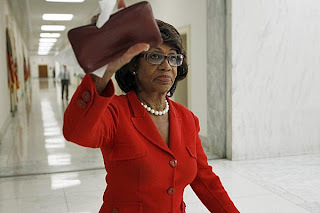 "I have been denied basic due process,'' Waters said Monday, standing in front of the empty Capitol Hill hearing room where the charges against her were to have been heard by a bipartisan panel of eight fellow lawmakers. Earlier this month, the trial was put off indefinitely. Committee members put off Waters' trial because they said they had found new evidence that warranted further investigation. Waters is accused of intervening improperly on behalf of OneUnited bank, on whose board her husband served and in which he owned stock. Three months after she called then-Treasury Secretary Henry M. Paulson during the financial crisis to set up a September 2008 meeting between his staff and representatives of minority-owned banks, OneUnited received $12 million in federal bailout funds. Waters, 72, has defended her actions, saying they were in keeping with her work to aid minority-owned businesses. She repeated on Monday that she had not received any financial benefit.